It has been forever since I’ve posted a new blog recipe; however, sometimes life just gets in the way! Over the past two months I have moved and have been lucky enough to find the love of my life!! Work has begun to get busy again and I just haven’t had the time to spend baking or cooking. 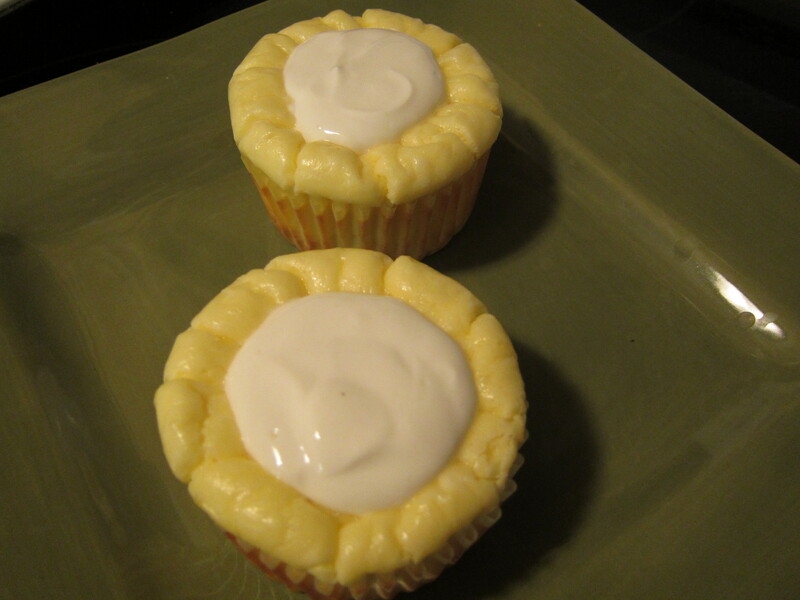 This week as I was sitting at my desk I begun to have an intense craving for cheesecake and I remembered these cheesecake cupcakes that I tried but never made myself and I instantly knew that this weekend I was going to make time to make them. These cupcakes are insanely easy to make and taste amazing. They are the perfect size for cheesecake lovers like me who fear making an entire cheesecake because they know they would eat the whole thing themselves! Prepare a cupcake pan by lining it with paper cupcake liners and set aside. Pre-heat the oven to 300 degrees. Pour or spoon the batter into the prepared cupcake liners, filling each cupcake as full as you can. Bake for 30-40 minutes until large cracks appear on the top of the cakes. Remove from the oven and cool for 5-10 minutes. As they cool, the middle of the cakes will sink in. In a small mixing bowl, using a spoon, mix all of the ingredients for the topping. Add approximately a tsp on the top of each cupcake and return to the oven for 5 minutes. Allow the cupcakes to cool for 5 minutes before moving them to a cooling rack to completely cool. Keep the cupcakes refrigerated once completely cooled. Enter your email address to follow A Taste of Meghan's Kitchen and receive notifications of new posts by email. © 2011-2013 A Taste of Meghan's Kitchen. All rights reserved.